St. Martin's Press, 9781403971081, 291pp. Does the people's need to believe in the president trump their duty to understand, to think critically, and demand truth? Have Americans been conditioned to ignore political frauds and believe the lies perpetuated by campaign ads? 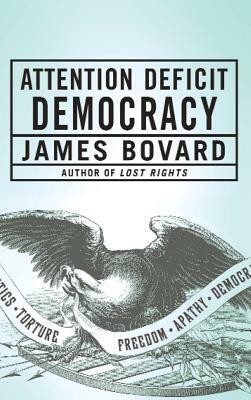 James Bovard diagnoses a national malady called "Attention Deficit Democracy," characterized by a citizenry that seems to be paying less attention to facts, and is less capable of judging when their rights and liberties are under attack. Bovard's careful research combined with his characteristically caustic style will give "ADD" a whole new meaning that pundits, politicians, and we the people will find hard to ignore.